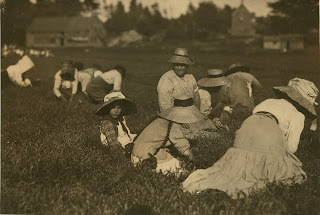 While the image of smiling children on cranberry bogs, pails in hand with the September sunshine on their faces may present an idyllic picture of local rural childhood a century ago, in truth the employment of children on local cranberry bogs was an often overlooked aspect of tthe child labor problem in America. In 1893 when the Plymouth Old Colony Memorial reprinted the following small news item from one of Middleborough's newspapers, few people probably showed little surprise when they read of the subject's age. 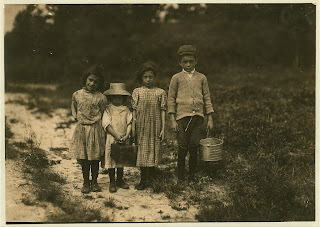 "A little girl in South Middleboro five years old," ran the report, "picked 28 quarts of cranberries in one afternoon". While the item was published to bring attention to the young girl's remarkable achievement of picking so many berries in so short a period of time, the more troubling aspect of the report was the girl's age. In fact, children as young as three years old were regularly employed during the cranberry picking season in September and October, not only in Middleborough, but throughout the cranberry-growing regions of the nation. Young children throughout the 19th century had assisted their families with agricultural chores, so it was not a radical step for parents to consider putting their children to work alongside themselves on local commercial cranberry bogs. This development was encouraged by the great need for pickers during the late summer when the berries were ripe for picking. To sate the demand for pickers, young children and older family members were all put to work. Meanwhile, many families were compelled through economic circumstance to put their children to work, so necessary were the wages which they were able to earn. Children would be engaged in all manner of tasks on the local bogs, including picking by hand and toting. Conditions on the bogs could, at times, be inhospitable. Frequently damp in the morning, the bogs were also subjected to broiling sunshine in mid-afternoon as child pickers slowly made their way on their hands and knees over the vines. Further, sanitary facilities for workers were frequently lacking. Despite these conditions, child labor on the cranberry bogs typically garnered little attention from reformers or lawmakers as children were generally employed in the company of their parents who could therefore oversee their welfare directly. Increasingly, however, child agricultural labor, like child industrial labor, was viewed as detrimental to the development and well-being of children, not only because of the physical conditions noted above but particularly when it interfered with their attendance at school. Local schools, in fact, like that at South Middleborough did, in several years, close for the harvest season so that children could assist with picking. The Middleboro Gazette in September, 1905, and again in 1909 reported that school attendance was adversely affected by the start of the harvest as children were absented from school in order to engage in picking. In 1904, the National Child Labor Committee was established to promote "the rights, awareness, dignity, well-being and education of children and youth as they relate to work and working". As part of the committee's work, child labor conditions in a wide range of industries, including agriculture, were investigated and documented through both reports and photographs in an effort to strengthen federal child labor laws. 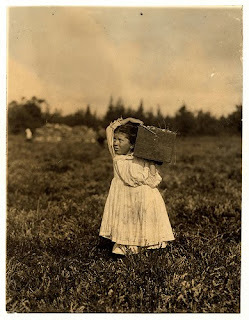 One particular field of study was the cranberry industry, and noted photographer Lewis Wickes Hine (1874-1940) documented child workers on the Eldridge Bog in nearby Rochester, Massachusetts, as well as in New Jersey and Wisconsin. In his work, Hine found children as young as three years old being employed to harvest berries during the September and October picking seasons. In 1938, the Fair Labor Standards Act was adopted with provisions governing child labor in agriculture. 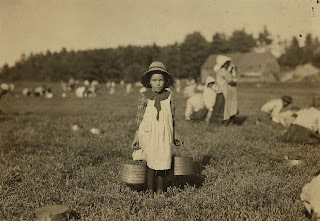 Children were prohibited from working during school hours, and restrictions were placed upon the employment of the youngest children such as the unidentified South Middleborough girl of 1893. "Anne Benotte, said 7 years old. Brother Vincent said 11. Vincent picked last year. Inez, sister said 6 years old, "and picked last year wid me mudder." Smallest one not quite large enough to work. Father works in Parker Mills. Location: Parker Mills [vicinity], Massachusetts." [National Child Labor Committee Collection, U. S. Library of Congress]. Rosie Passeralla, photograph by Lewis W. Hine, September 28, 1910. "5-year-old Rosie Passeralla, 1116 Annan Street, Philadelphia. Been picking here two years. Whites Bog, Browns Mills, N. J. Sept. 28, 1910. Witness E. F. Brown. Location: Browns Mills, New Jersey." [National Child Labor Committee Collection, U. S. Library of Congress]. Jennie Camillo, photograph by Lewis W. Hine, September 27, 1910. "Eight-year-old, Jennie Camillo, lives in West Maniyunk, Pa. (near Philadelphia). For this summer she has picked cranberries. This summer is at Theodore Budd's Bog at Turkeytown, near Pemberton, N.J. This is the fourth week of school in Philadelphia and these people will stay here two weeks more. Her look of distress was caused by her father's impatience over her stopping in her tramp to the 'bushelman' at our photographer's request. Witness, E.F. Brown. Location: Pemberton, New Jersey." [National Child Labor Committee Collection, U. S. Library of Congress]. Smallest One Merilda, Picking with Her Sister, photograph by Lewis W. Hine, September, 1911. The photograph was taken at the Eldridge Bog in neighboring Rochester, Massachusetts. [National Child Labor Committee Collection, U. S. Library of Congress]. Merilda Carrying Cranberries, photograph by Lewis W. Hine, September, 1911. "Witness, Richard K. Conant. Location: Rochester [vicinity] - Eldridge Bog, Massachusetts." [National Child Labor Committee Collection, U. S. Library of Congress]. 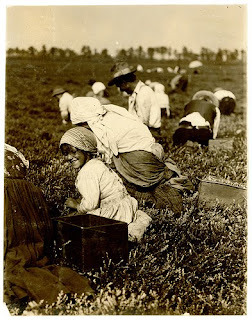 National Child Labor Committee Collection, U. S. Library of Congress. Old Colony Memorial, October 28, 1893, page 4.